As a wider range of wireless earbud designs keep hitting the consumer market, one critical factor starts coming into play: comfort. Thankfully, companies like 1Voice put that front and center with their Bluetooth wireless 2.0 earbuds design, available now for $59.99 (53% off) in the TechnoBuffalo Deals Store. For true minimalists, the 1Voice earbuds pump out superior sound quality without sacrificing simplicity or ergonomics. 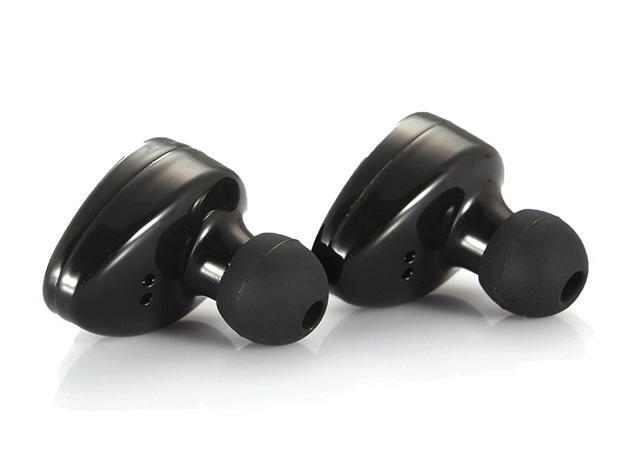 They're easily among the smallest, most lightweight earbuds available, yet their Bluetooth 4.2 capabilities assure you'll get brilliant audio, seamless syncing and a rock-solid signal extending up to 30 feet. Despite their compact size, each bud sports its own speaker and mic to be used separately or when offering an all-encompassing sonic experience. Plus, their smooth design fits into your ear snugly and comfortably – so you can wear the 1Voice earbuds all day without fatigue. Not only do the buds charge in their own handy charging case – they play continuously for up to five hours. Valued at $129, you can get the 1Voice wireless earbuds right now for only $59.99 with this limited time deal.